I like the wheels. They might have a little "high speed wobble"
Being driven by Bing Crosby look-alike. It looks like a 'teacup" oil pan under the car,but that is about it for being a Ford. Did other cars have that type of drain plug? 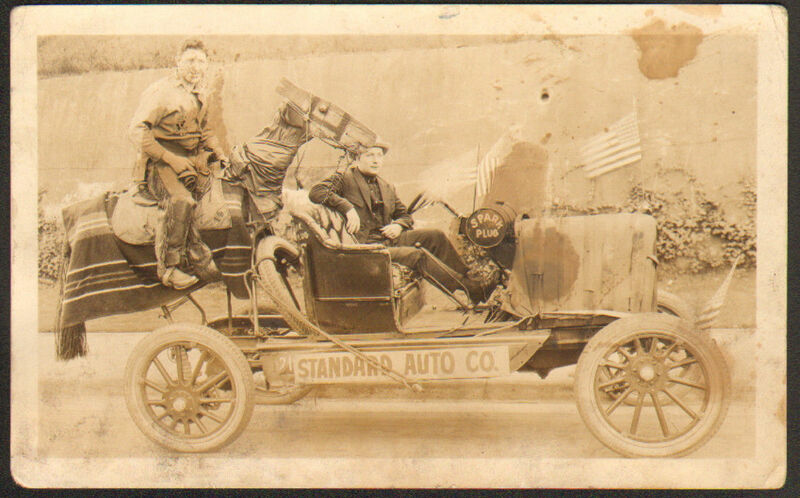 I think it is a late teens-early 20's Overland. Their front and rear springs were set at an angle and the rear one can be seen through the spokes. I would think they had the wheels offset so the horse would look like a bucking bronco as they drove down the street. Overland also mounted the gasoline tank on the firewall that way. REO trucks did also. The pan is not Ford. Many other companies also used large drains like that. I don't know Overland well enough to speculate on that, but I do agree with Richard E. The front and rear springs do look like Overland. Thank you for sharing this photo! One of the best showing bucking wheels I have ever seen.